It seems that in the past week alone, trees in the coastal south are beginning to burst into bloom. After months of gray winter landscape, tiny bits of vivid color peek out, hinting of more to come. On the street, ruffled trench-coats and fluttery dresses imitate hues painted by Mother Nature... daffodil, wisteria and poppy. As much as I love the crispness of autumn air after a blistering summer, nothing compares to the suspenseful signs of spring. It makes me want to eat lighter as well. Spring says, put those saucy comfort foods away, toss things together, pull something out of the ground and eat it raw. Growing up in Florida, I waited impatiently for strawberry season each year. Fresh, juicy berries begin populating the produce shelves in early March. In my humble opinion, nothing compares to the sweetness of a Florida strawberry. I have seen several variations of this recipe. Some use mango and pineapple, some called for nectarines, peaches or blueberries. You can mix it up and toss in what ever fruit is in the house. If you are working your way back into last year's swimsuit, you could use low sugar jam and a pinch or two of stevia instead of sugar. Combine all fruit in a large bowl. Mix jam and sugars in a small bowl. Gently stir into fruit. (If you stir too hard, it will all turn purple from the berry juices.) Set aside. Place tortillas on baking sheet. Spray one side with cooking spray. Sprinkle with cinnamon-sugar. Prick lightly with fork. Bake in 300 degree oven until brown. Turn over and repeat. Break into pieces. 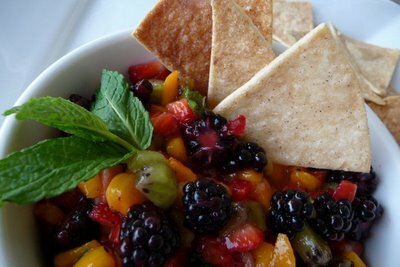 Serve with fruit salsa. 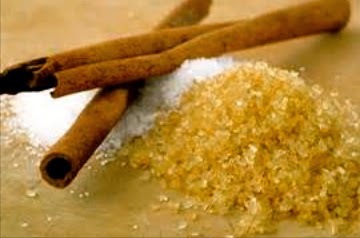 *Basic recipe for cinnamon sugar: 6 parts sugar to 1 part cinnamon.